Am I the only one who gets a little carried away with planning even the simplest of events? 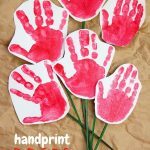 Last year, my daughter and I hosted a small Queen of Heart’s Valentine’s Party – just a couple of friends, just a couple of hours in the afternoon.. so you’d think that I would just plan a couple of activities and leave it at that, right? Nope, I prepped four different activities to ensure that the girls were happy and entertained for the whole visit – and that was in addition to planning a screening of the Walt Disney version of Alice in Wonderland. We made fizzy roses (a take on our fizzy hearts experiment), I bought a giant game of checkers, set up a game of croquet in the playroom (similar to this one), and bought a bunch of white fabric roses for the kids to paint. We never got around to painting them at the party so the roses just got put back into our Valentine’s Day bin and were completely forgotten about until this year when we opened the bin back up. 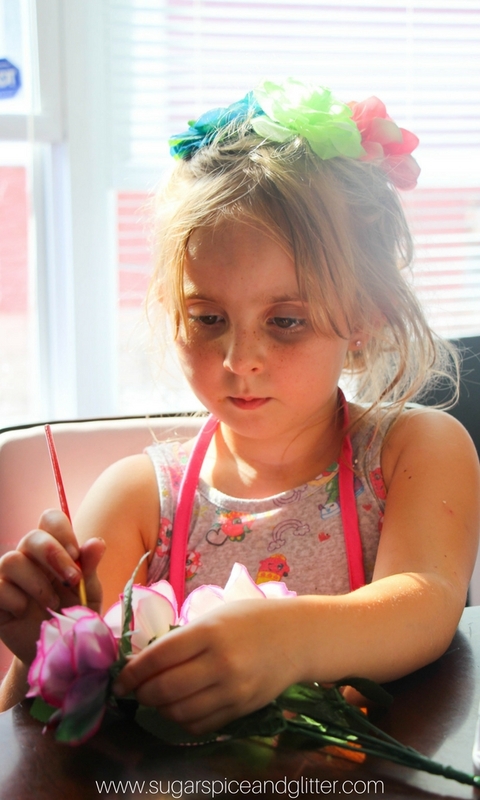 My little Frida Kahlo saw the roses and immediately remembered that we had intended to paint them at the party – only this time, we weren’t simply going to paint them red. 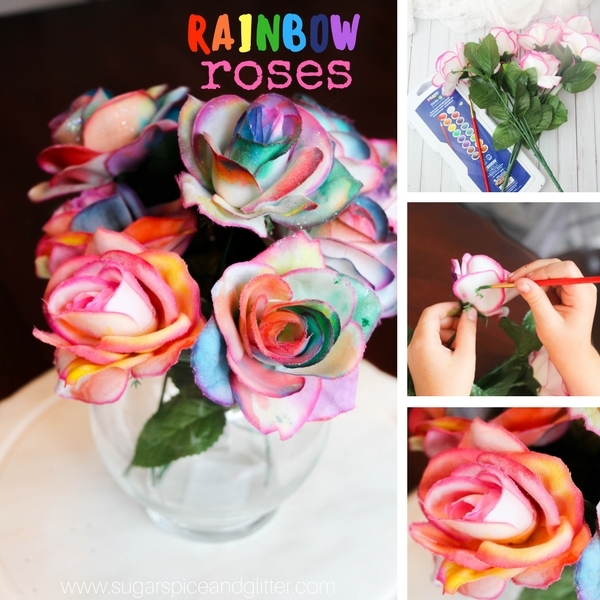 Oh no no no – just like she did with our Rainbow Tree craft, this crafter decided that we were going to paint the roses rainbow. 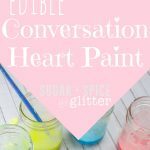 This was such a low-key craft to make – we used a combination of regular watercolor paint and glitter watercolor paints for an unexpected touch of sparkle. 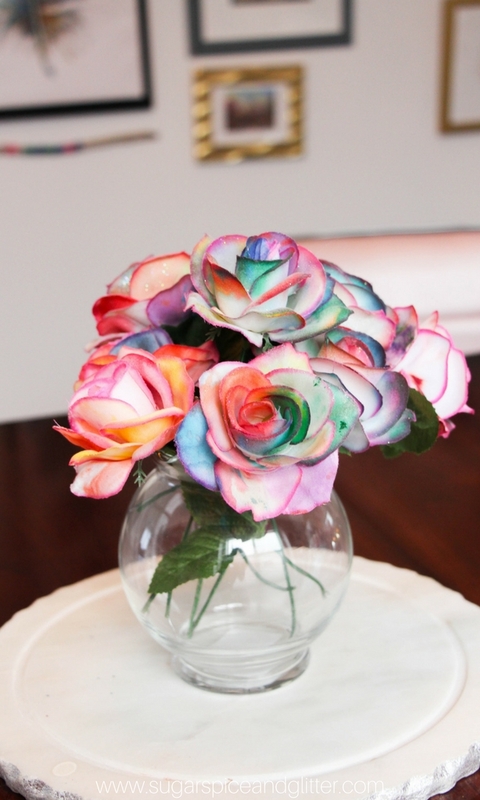 My daughter initially did three roses in one sitting and then we just added more roses in slowly – when she had a few minutes extra in the morning, she’d paint a rose and add it to the growing bouquet. 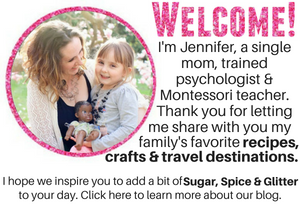 This would make such a sweet gift (Mother’s Day, Valentine’s Day, Teacher Appreciation, etc) and you could have multiple kids work on it – it might be interesting to see the effects and color schemes each child chooses. Tip: I like to do our painting activity on these kitchen trays – I can easily move the tray while the craft is drying and it protects my table from stains. 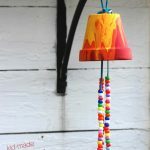 This craft is incredibly simple, just prepare a clean working surface and have plenty of water and a rag or paper towels to clean your brush. Mix a bit of water with the watercolor paint and apply to the flower. I found over-saturating the watercolors with water made it easier to apply the paint to the fabric. 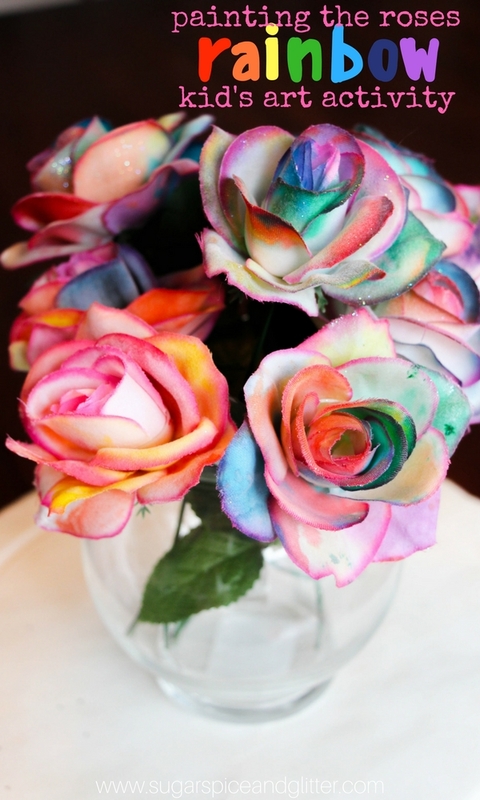 Experiment with different color combinations and methods of applying the paint to the roses. 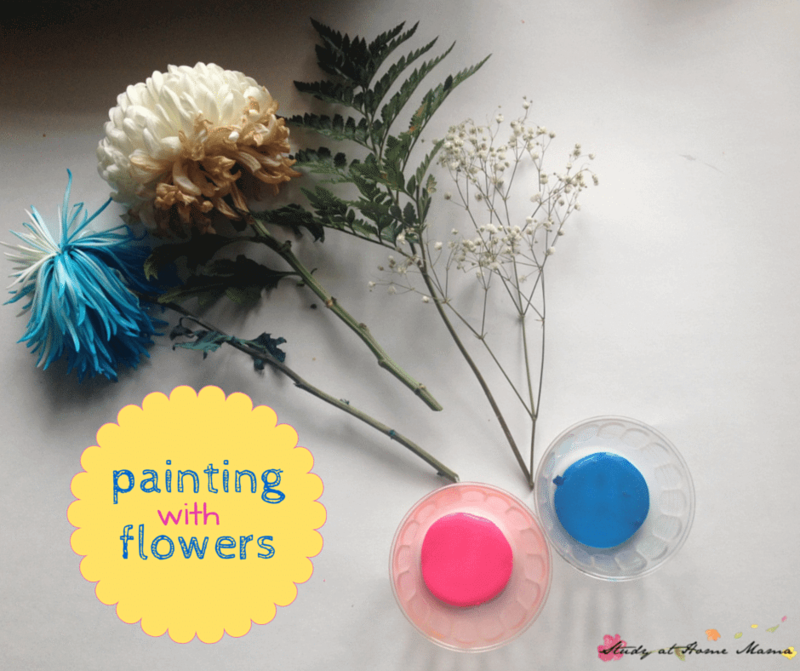 Maybe you’ll add a thick layer of paint to part of a petal and add some water directly to it to see how the color spreads along the petal. 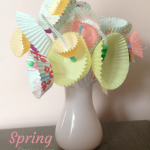 Maybe you’ll try mixing colors directly on a petal. There is no wrong way to do this craft. 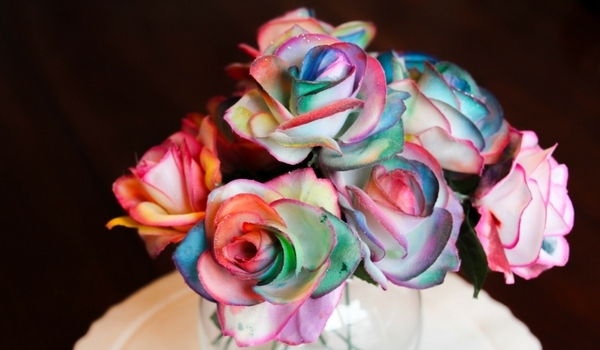 Experiment with different color combinations and methods of applying the paint to the roses. Maybe you'll add a thick layer of paint to part of a petal and add some water directly to it to see how the color spreads along the petal. 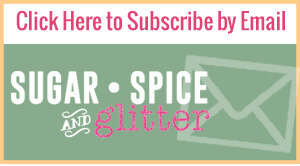 Maybe you'll try mixing colors directly on a petal. There is no wrong way to do this craft. 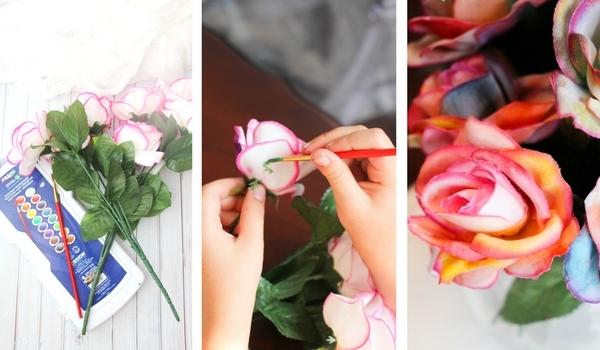 This easy rose craft for kids doubles as a beautiful Valentine’s Day craft, Mother’s Day craft – or just a pretty way to add some color to your home! 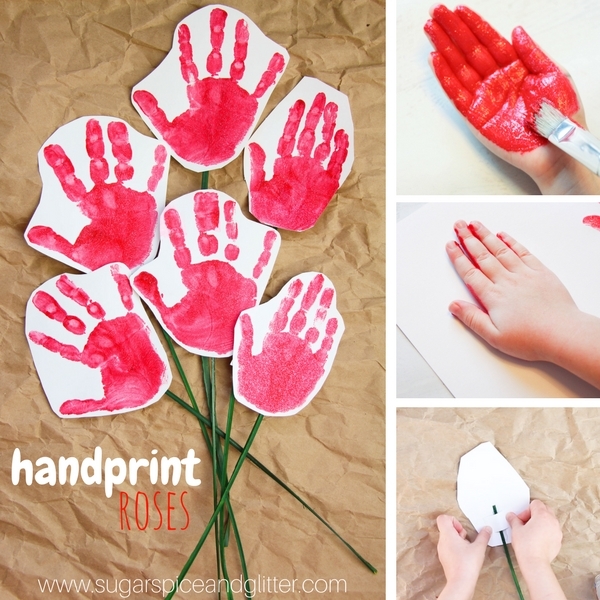 For more fun flower ideas, check out our Painting with Flowers art activity or our Handprint Roses.